I love dried fruit, nuts and seeds. And together they are magical. So magical that once I start eating them their powers take over me and I cannot stop. Alas, I love granola, trail mix and fruit and seed bars. Since I know myself very well I typically don’t keep granola or trail mix in the house and if I do I need to keep it in single serving portions. 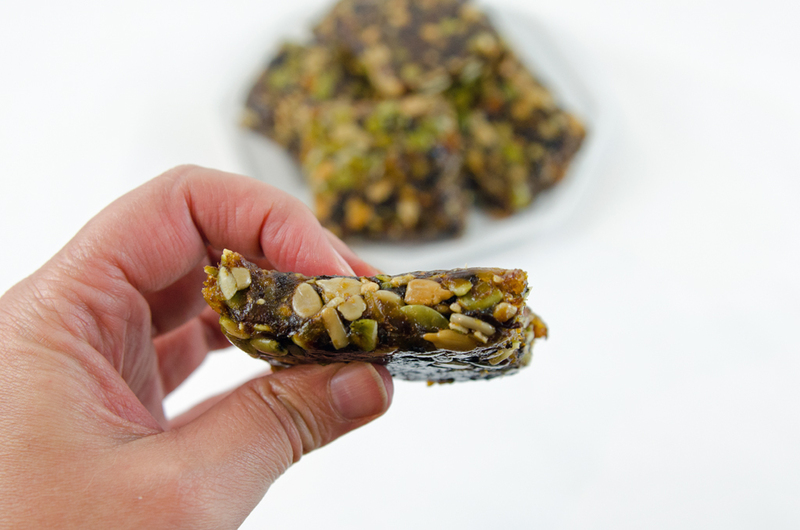 Fruit and nut bars, nicely come in single serving portions but I find that if they can be dry and lack big fruit flavor which is why I make my own. Not only can I control the flavors I can also control the ingredients. This recipe is one of my favorite. 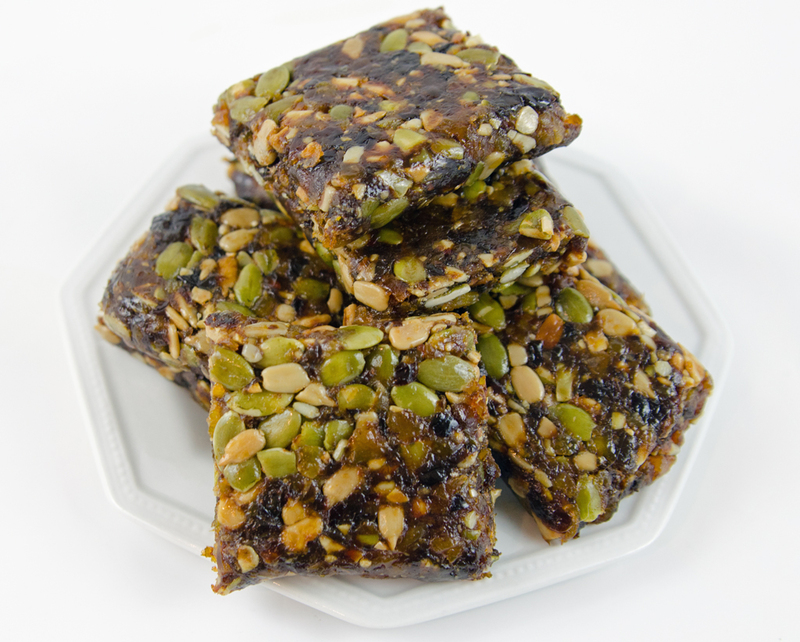 I love the crunchy seeds, sweet fruit and salt from the roasted sunflower seeds. 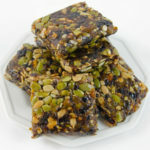 I often have a bar before I exercise or as a sweet treat with a cup of tea in the afternoon. They are a perfect portion and quite an indulgence for 150 calories. 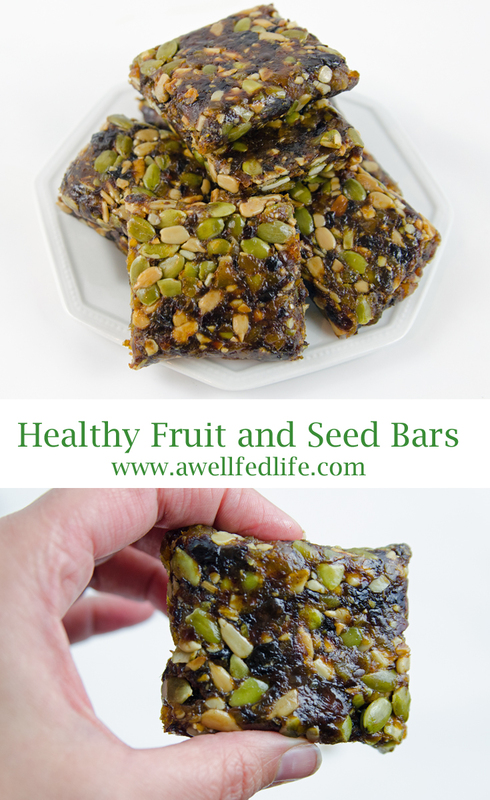 These bars also have a ton of fiber which is always awesome. I like them best when they are chilled. 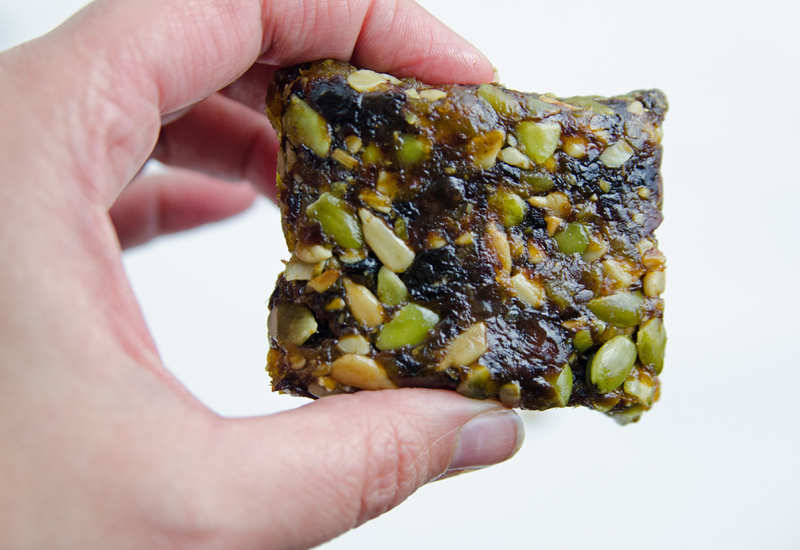 If you like a soft and gooey bar you will love them at room temperature. In a large bow, heat coconut oil so it liquid (about 20 seconds in the microwave). 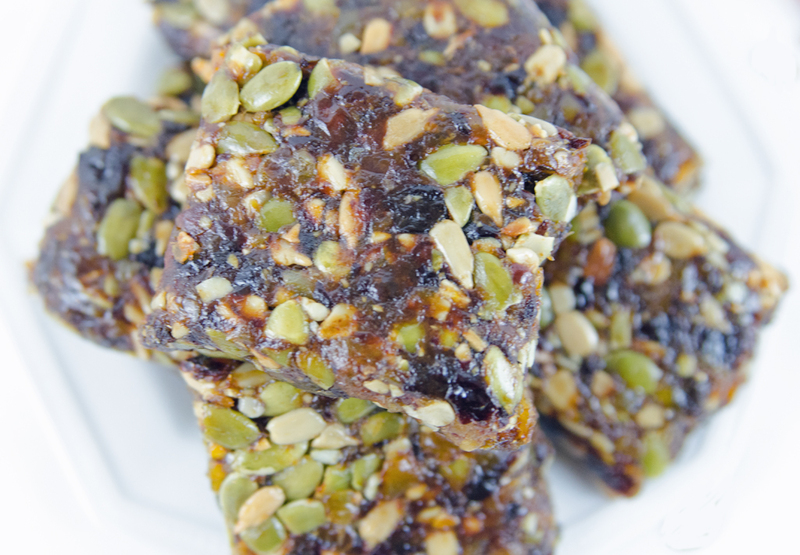 Mix in dried fruit. In a food processor, slow add fruit and pulse. Continue to pulse until fruit is a paste with small bits. Continue to pulse and slowly add seeds. Pulse until combined. On a piece of plastic wrap pour out mixture. Roll tightly into a log. Wrap in plastic paper and with a rolling pin roll until flattened. Keep ends formed so it becomes a rectangle. These bars keep for up to a week an a sealed container. They can be refrigerated. Very Good and tasty!! Be careful not to use the processor too much, or else you will have a paste with no chunks or pieces of fruit. In an effort to mix the seeds thoroughly, using the processor tends to grind them too much. it may be a good idea to mix the seeds in by hand so they remain whole or in large pieces. I will make this recipe again, but will modify it. I use the pulse mode on my food processor and I do add the seeds in last. Thanks for your tips Don.